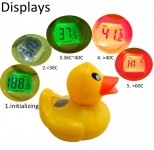 A great way to increase bath safety and comfort at bath time, This bath themometer can be used young or old, does not matter as the unit has a great visual display with the warning colours of the lcd giving easy to see notification of the bath temperature. Brilliant..!....I use it when outdoor swimming....easy to read and love how it switches itself on and off. Can I suggest you advertise in the Outdoor Swimming magazine..? I bought three of these and only one of them worked at all. The other two were both completely dud. I bought this item for my little boys bath. It seems to work very effectively and looks great too. Very pleased with it so far.